Welcome aboard the famous Agawa Canyon Snow Train for a breathtaking journey into the land of the winter giant. Experience this truly unique look at Algoma Central country, clad in a mantle of snow and adorned with sparkling diamonds of ice. Gone are the greens of summer and the fiery colours of autumn, the brilliant white of winter is everywhere. Your journey begins at our train depot located in downtown Sault Ste. Marie, Ontario, Canada. As the train pulls away from the station, you will pass through the city�s industrial area, but within minutes the forests will begin to take over and a winter wonderland will unfold before you. 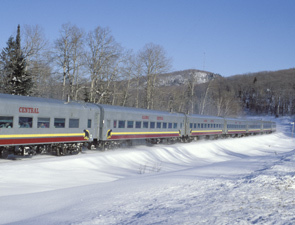 As the train winds its way northward, snow laden trees will give way to panoramic views, towering trestles, snow-choked rock cuts, frozen lakes and waterfalls transformed into fantastic ice sculptures by the cold breath of winter. As the train winds its way through this immense land a GPS triggered tour commentary - available in five languages including English, French, German, Japanese and Mandarin -will tell you about the upcoming points of interest and share some of the rich history of the region with stories of the Ojibway, fur traders, explorers and entrepreneurs that opened up this vast wilderness and called it home. Just when you thought you�d experienced it all the train will begin its decent to the floor of the canyon at Mile 102 and as the rail line hugs the top of the canyon wall you will travel down 500 feet over the next 10 miles. Once you arrive on the floor of the canyon the train will stop briefly before beginning your return journey back to the Sault. Unfortunately, due to snow and winter weather conditions passengers are unable to detrain during the stopover. Experience all of this while nestled in your reclining seat as the warmth of your picture window coach keeps �old-man winters� subzero temperatures at bay. Whether you�ve travelled with us in a warmer season or are joining us for the first time, we are sure this unique one day rail excursion will leave you in awe of the majestic power and beauty of a Canadian winter. The dining car remains with the train throughout the tour and service includes full breakfasts, hot and cold lunches, sandwiches, cold drinks, coffee, tea and alcoholic refreshments. Please note Provincial Law prohibits the transportation or consumption or personal alcohol on-board the train. Please Note: Due to the negative effects of the extreme winter temperatures, the locomotive mounted cameras and flat screen monitors that are part of the summer and fall Canyon Tour cannot be offered during the Snow Train.